Since the start of this year, we have continued to elevate our standing in the floorcovering industry – a result of INSTALL’s superior resources, capabilities and partnerships. 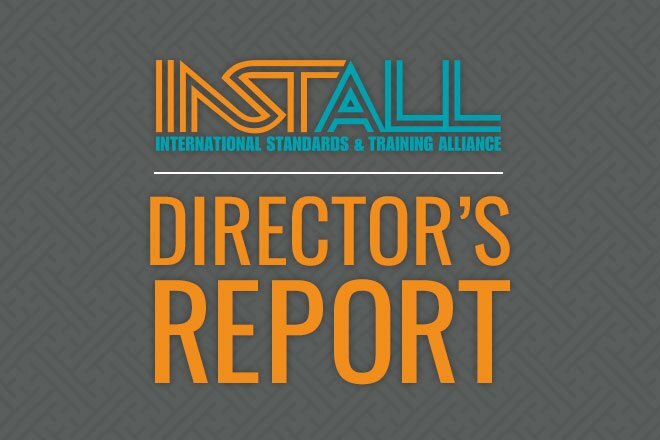 As we approach mid-2019, INSTALL is excited to share the latest news and developments. After years of great leadership as INSTALL labor co-chair Andy Silins has retired. We thank Andy for his many years of great leadership and service. At the same time, we welcome new labor co-chair Mike Capelli. I have complete confidence in Mike’s vision and the direction he will help take INSTALL moving forward. We also look forward to working with new District Vice Presidents Bill Waterkotte (Eastern) and Mark McGriff (Midwestern), as we continue growth in those areas. The Carpenters International Training Fund (CITF) hosted the first concrete polishing curriculum review last month and concluded a follow-up review in early April. The CITF recruited industry leaders to review our curriculum, including representatives from our contractors, instructors and leadership of the American Society of Concrete Contractors’ Concrete Polishing Council (CPC). Additionally, the CPC has opened a slot on their Technical Committee for INSTALL. These are two key examples in the ways that INSTALL is expanding our position as the industry leader in an evolving floorcovering market. I would like to commend INSTALL Warranty Contractor Image Flooring and the Central South Carpenters Regional Council (CSCRC) for their efforts in striving for our goal of 70% market share by growing our presence in key regions of Oklahoma and Texas. They have embraced labor-management collaboration and have successfully won new work and recruited new labor that has received proper training and certifications. Image Flooring’s Jim Wilkinson and Doug Wilkinson of the CSCRC – although not related – are true INSTALL Brothers, leading their teams through every challenge encountered in the process. We have Helmets to Hardhats (H2H) participants actively seeking floorcovering apprenticeships across North America. I continue to receive solicitations weekly and our veterans have proven to excell as INSTALL certified professionals. If you would like to support the H2H program, please reach out and INSTALL will help you. We welcome all to participate in tackling our greatest challenges, while creating and sharing best practices, in the monthly INSTALL Forums. These occur the last Thursday of each month, at 4:00 p.m. Eastern. You are invited to share your own thoughts and experiences, which also help support our chairmen and their committees. Committee chairmen Rich Williamson (Recruiting and Retention), Kyle Smith (Next Gen Development) and James Barr (Journeyperson Skill Enhancement) encourage everyone to lend their ideas and aid in the development of our Brothers and Sisters. If you would like to connect to the next INSTALL Forum and do not have the access needed, please contact INSTALL.